I came across an excellent post from one of my former NT teammates Brenda (Boroski) Westwood that I thought was to valuable not to share with you. played Jr. National team for 2 summers, Captain in 1985 where the team won Gold at International tournament in Italy… defeating the US in the finals. Brenda came to the team for the year that I had transitioned to full time setting. In fact, this young "little" feisty setter, who is one of the funniest people I have ever met, taught me a lot about setting and dealing with hitters that no coach would ever teach me!! shhh..and will remain a "setters secret". Now a successful youth coach, Brenda has many gifts to bring and I am happy that she is letting me share her knowledge here on my blog. It's time kids!!... lets talk about Setters!! Yay! Of course this is my favourite topic because I get a kick (not really) out of talking to coaches about setters. Unless you have set for a long time, it is hard for a coach to understand all the jobs that a setter has to do... besides actually playing!! - Setters must be able to think on the fly... take a look at the opposition and try to figure out HOW to 'create' then attack the gaps with the best option for the team needs to get a kill with the type of offense they call. - They need to figure out and deliver the set types and specific location of those sets (ex. push 51, inside high for line shot, backset either inside or at the antenna, if dumping is an option, where the defense on the other side is weak, and what tempo will work best against that specific opposition. - They need to figure out who likes which set, and give them the highest chance for success, either with the actual set or the combination that creates an open lane for it. - They usually have to adjust to middles coming in at all different speeds and angles (even though they shouldn't have to adjust to speed, it should always be superfast) often they must set a middle who hasn't even gotten two steps off the net, but the gap is there and that set needs to be made even forced! - Setters know that a fast middle sets up everything... combos, isolation, seams etc. This is the 1st ingredient in engaging your setter in a fast, fun, smart and effective attack. (correct me if I'm wrong setters... but a high ball is NOT a challenge, nor is it fun and unless you have an entire stable of horses it usually ends with a Loss) Speed kills. Speed = isolation kills. - Setters have to read hitters and decide when to release from defense to run in and transition the offense... coaches: this is fun!!... STOP asking your players to dig the friggin' ball into the center of the court!!! all that does is force a high ball attack with two solid closed blockers. Why not expect more? Even my brothers 12U girls are digging the ball to the setting spot... setters job is to get there. - Setters are usually the liaison between coach and players and have to work together to create a winning offense... Nothing more frustrating than a coach that doesn't understand what a setter needs and wants to do. - All of this AND setters, please add to that mixture, trying to deceive the opposition blockers by disguising your set using different body and hand position. - also setters... please do all of this regardless of the quality of the passes or digs. Not too much to ask, is it? AND this is only 1/4 of the stuff you need to teach and do... there is soooo much more, but you get the picture here. Coaches: coaching setters is as much or more conversation as it is reps. That is why choosing a setter (and libero, but that's next weeks topic) who is a tactician and loves figuring all of those things out, is crucial. I can guarantee that some coaches will read this and either not understand what I mean, or they will realize that they have some work to do for their teams. Brenda, intense and confident, as she listens to strategic advice during her 5 years at UW with coach, Mike Burchuk. Mike was my coach for the 1996 Olympics. He was a great technical coach and improved my setting technique significantly in the 14 months he coached me. Proving you "can teach an old dog new tricks!!" Brenda (Captain,#3) setting for Canada Junior Team for 2 summers. Middle player is Kristine Drakich, 2016 CIS Champion coach for University of Toronto and former national team player. Recently, I came across a couple of facebook posts this past week that really hit home for me. As I am watching the world and local events, a common theme seems to be just below the surface all the time. The theme being, lack of respect for others, entitlement, and just not being kind to each other. These two articles I would like to share go "beyond the ball" and speak more to "you" as a coach or player. The video speaks about being respectful and not entitled. My generation of athletes grew up this way, we respected the game/coaches/country and especially our parents. If young athletes are not learning how to be respectful at home, then it is up to coaches to teach them (and if the coaches haven't learned it... GET ON IT!! you may be part of the problem). Here in this video, a college team coach educates his players on "who earned the right to sit on the "chairs". well worth the watch. This next article is fantastic. I know club volleyball is very different than when I played. My coach picked a few of us up at home and back for practice and tournaments. We raised money for travel by working at the bingo hall (this was when smoking was allowed indoors and the room was half filled with unbearable smoke). We travelled in the team van together, ate together, bunked together.. and to this day I am still in contact with many of my former teammates. This type of bond/friendship is one of the main reasons for playing team sports. Here is an excellent article on what you are actually paying for when you pay for your child's club fees. It's time to get your PanAM Volleyball tickets!! Canada is doing great this year on the international circuit...from Beach medals to World League!!! Come out and cheer them on on their home court!!.. Let's show up with our Canada jerseys and help them get to the medals!!! Click on the picture on the right for tickets. Coaches, athletes, and parents... this is a great opportunity to take part in a wonderful sporting festival!!.. Who knows when we will see such a sight again in Toronto!! Pan Am Torchbearers Relay - SIGNUP!!!! The 2015 Toronto PanAM Games have launched their torch relay runner signups.. It is hitting many parts of Ontario and various cities across Canada. I encourage you strongly to put your name forward to run the 200metres!! You will have the experience of a lifetime! 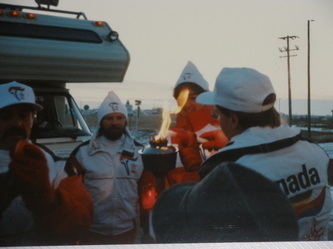 I ran the Olympic torch for the Calgary 1988 games.. drove from Regina to Brandon Manitoba to do so in the middle of January!!!... It is one of the highlights of my career!! Here is another out of the gym exercise that young athletes can do to improve their overall fundamentals with speed and agility. Please leave a comment, would love to hear if you have used, are attempting or introducing these games to your kids!!! Here is another video in my series of playing "kids games" in my youth and how it can help your volleyball skill development. This video works on your jumping skills (we used to call it "jumpsies" back in the day). Chinese Jump Rope - works on your jumping skills, timing and as you get better you move through it quicker. Mom's out there teach your girls about jumpsies with elastics (collected from the postman) or your mom!!! In every "field-played" sport, from soccer to badminton to basketball to tennis, the primary movement is with the feet. Volleyball is no different!!... even though we play the balls with our arms and hands and jump in the air... without moving our feet to the ball first, it makes anything after that more difficult. the key is to PRACTICE THIS AT HOME... the coaches do not have time in practice time to work on improving your own footwork.. You need to take your own responsibility to do exercises that will improve your quickness, agility and contacts. and how we convert them to volleyball skills!! For the past month, I have been working summer camps with young volleyball athletes of all ages. The common factor I see with all of these kids is that in general they are pretty good with their volleyball development however somewhat lacking in their footwork and conditioning. I am working on a series of videos aimed at the young athlete (and for those older athletes who still need to work on faster feet and coordination). In fact I did a lot of these "fun" games at the national team level. As I repeat over and over again in my inspirational messages to kids, volleyball is the same game at every level, it is just the execution that is different. These are games that I did endlessly as we "played outside"... a concept we need to reintroduce to our youngsters... that I wholeheartedly believe made me an overall highly coordinated athlete. *please note that the first part of the video you can't really here me talk over the dubbing (I think done on my purpose by my young athlete ;) ... I basically explain the above concept..
Toronto is 1 year away from the biggest sporting event it will have hosted!!! The PanAm games will bring 10,000 athletes to the GTA next summer in what can be described at the Olympics of North & South America. I participated in 2 PanAm Games in Caracas in 1983 and Indianapolis in 1987. Many of the top volleyball teams in the world come from the PanAM countries.... Brazil, Cuba, Dominican, Mexico, Argentina and of course our men's and women's team from Canada... both in beach and indoor volleyball. I strongly urge any young athletes to get involved as a volunteer for these Games... the experience will be one of a lifetime!!... If you can't get into volleyball, try for the many other volunteer positions available... even a dancer in the opening ceremonies!!.. You will never forget it. It has been 30 years since I participated in the Panam Games and the memories and friendships are still lasting. If you can't get down tomorrow, on Sunday, Markham will be hosting a street festival from 2-8pm. hope to see you with your Canadian colours on!! The Art of Coaching Clinic in Toronto was a great event with over 220 coaches from grade school to college attending. Russ Rose (Penn State), John Dunning (Stanford) and Terry Liskevych (USA coach while I was playing) brought their vast knowledge of experience to a receptive crowd. Along with Kristine Drakich (UofT), Dave Preston (Mac), Brenda Willis (Queens), I was brought in to be a guest presenter. Naturally I talked about setting - basics for one session and advanced for the afternoon session. I had a lot of fun doing it and am very grateful for the experience. If you had a chance to attend, I would love to hear your feedback of the clinic and if you didn't attend you can see the session at the Art of Coaching website. The website is a great resource for all your volleyball needs - from practice planning, to skills, to the mental part of the game from experts from all levels, even including our Canadian team coaches. As many thoughts of volleyball & my many days of playing come up for me these days, I thought I would share some insights with young & old players, coaches alike! !